Bald Movies – Charity Groundhog Day Marathon!! Hi there! If you don't know us, we're Jim and A.Ron, and we're the hosts of Bald Move. We're watching the 1993 movie Groundhog Day for 24 hours, starting on February 2nd, 2018 @ 12:01AM EST. Please support the National Alliance to End Homelessness during our marathon by donating here! Donating at that link ensures that our goal progress will be tracked properly, and you'll get an onscreen credit when you give! If you want to know how to participate, the entire marathon is happening over at twitch.tv/baldmove. If you're wondering why the movie is all chopped up and obscured, it's to respect Twitch's copyright policies. If you want to watch alongside us, you can purchase or rent the movie digitally on Amazon, Google Play, or iTunes. We begin a fresh watch at the top of every other hour. As previously mentioned, we have a stellar charity to support. If you recall, one of the defining moments of Phil Connors character is his heroic efforts to save "Pop", an elderly homeless man. In Groundhog Day, even with godlike powers, saving Pop proves impossible. In our travels across our country, we've seen how homelessness has increasingly been an issue that keeps getting worse but isn't getting the focused attention it deserves. From Huntsville to Atlanta to Seattle, heck right here in our neighborhoods in Cincinnati, far too many people are forced to live in the streets. To that end, we've decided to dedicate our marathon to Pop, and direct all funds raised during Groundhog Day to the National Alliance to End Homelessness, a non-partisan, highly rated non-profit group that aims to work locally and nationally on permanent solutions to get individuals and families back on their feet. As Phil discovered, it's not about keeping people warm and fed for a night or two. We need shelters, we need soup kitchens and food pantries, and they all need our time and money, but we also need to fund the difficult and tedious work of research, study, policy and planning to make real headway on the problem. We appreciate you stopping by. Feel free to hang out and watch us slowly lose our minds and sensation to our butts. And if you're able, please consider donating to help out the homeless. Hopefully we'll have 24 hours of trouble free streaming, but we're pretty new to Twitch and streaming in general. 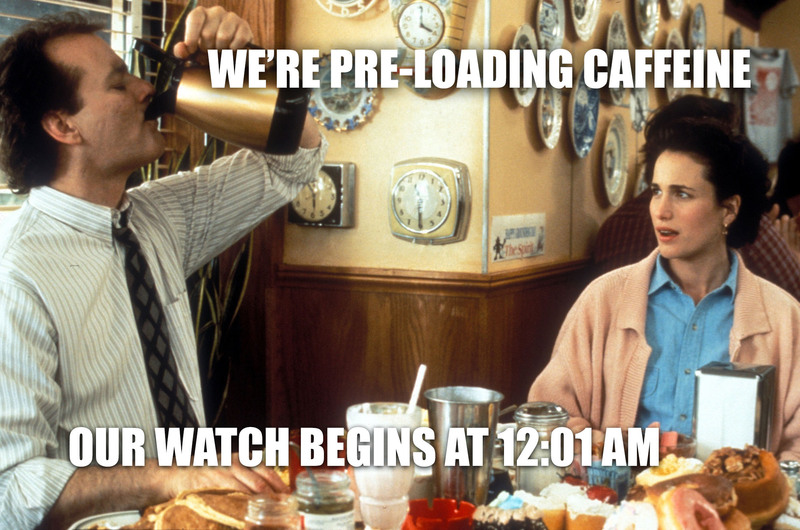 If there is a problem with the stream, live updates will be given in the official forum post for our Groundhog Day marathon.